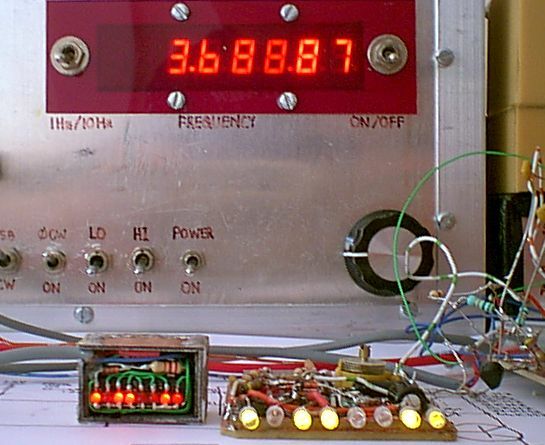 This is an incredibly simple and cheap frequency counter with binary readout, based on the ideas of Onno PA2OHH. I built two versions: one Mk1 "prototype" for development and optimisation of component values, and one miniature low current version Mk2 designed for inclusion in a portable battery powered rig. Both the counters can be seen in the photograph (click for a bigger image), along with a UK £2 coin which is about how much the parts cost for the Mk1 (approx US $3.60, 2004). 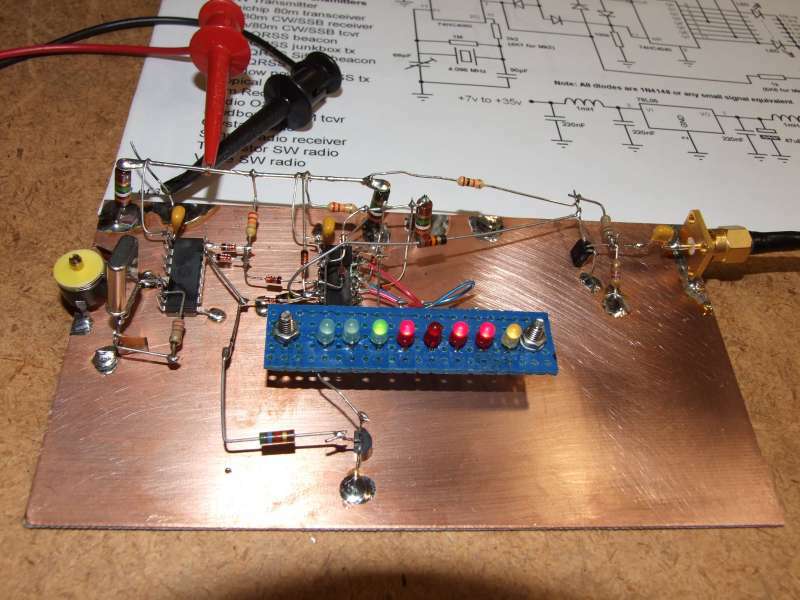 The fun begins with the excellent ideas of Onno PA2OHH, be sure to read his frequency counter page. One of his counters is pictured here. The original idea is simple and elegant. A 74HC4060 IC is the oscillator and timebase, which controls a 74HC4040 IC which in turn counts the incoming signal frequency. Half of each cycle is used for counting the incoming signal. On the second half of the cycle, the count is latched in a 74HC574 IC and the 74HC4040 is reset to zero. The state of the latched count in the 74HC574 is displayed on a row of LED's. I imagined a number of improvements to Onno's basic design, as follows. 1. The most important was the reduction from 3 to 2 IC's. I realised that the latch could be eliminated, by gating the incoming pulse stream so that it counted only during the first half of each cycle, then displaying the result only during the second half of each cycle by switching the LED's off during this time. I wrote to Onno about this and he built one possible implementation within a matter of days, long before I had a chance to build my own version. Switching the LED's at 50% duty cycle also means the LED series resistors can be reduced whilst maintaining the same average LED current, which decreases overall current consumption. 2. Onno uses 8 LED's which indicate 200, 100, 50, 25, 12.5, 6.25, 3.125, 1.5625KHz. These arise naturally and conveniently by design, from the choice of 6.4MHz crystal for the timebase. 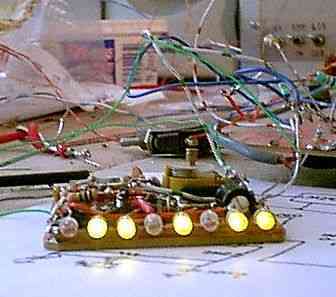 The frequency, as an offset from the lower band edge (or any multiple of 400KHz) is read by adding up lit LED's. Because all those decimals are inconvenient, Onno applies the approximation 200, 100, 50, 25, 13, 6, 3, 1.5 to make the mental arithmetic easier. I was uncomfortable with this approximation (call me pedantic) so I designed a version using a 4.096MHz crystal, which reads 64, 32, 16, 8, 4, 2, 1, 0.5KHz. A special AND-gate circuit resets the count back to 0 when it reaches 100, such that the display always reads 0 - 100KHz from the lower band edge or any multiple of 100KHz. Since my counter is intended for use in a 30m portable rig, the 30m band being only 50KHz wide, the higher resolution at the expense of reduced range is preferred. Other outputs of the 74HC4040 could easily be used to increase the range, or further LED's added for example. The binary sequence 64, 32... etc. is easily added up (at least to my mind), though some may prefer Onno's original scheme. Note that my counter is designed without Onno's MHz range which I won't need in my application, but that could easily be remedied. 3. Finally in the pursuit of the ultimate in low power consumption, I wanted to eliminate the LED resistors altogether. 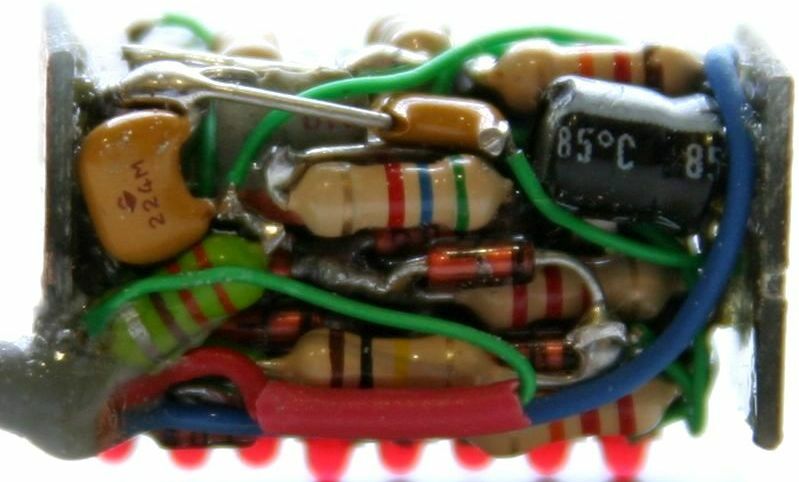 Those resistors lower the voltage to the LED's by simply dissipating it as heat, which equates to wasted power. An alternative is to apply the principles of switched mode power supplies, and pulse the LED's with the right duty cycle to obtain the average current required. Using a transistor to switch the LED's this turned out to be surprisingly simple. Below is the circuit diagram of the Mk1 frequency counter pictured to the right. Logically, the design requires two 2-input OR gates, a 2-input AND gate, and a 3-input AND gate. Think of the number of extra IC's you would require for this... but there is another way, namely the use of diodes and resistors to implement these logic functions. I find this method works extremely well where only one or two gates are required, avoiding the requirement for additional IC's. Note that the input is a TTL-level signal. Since there are a wide variety of possible signal levels between the different equipment this counter might find use in, I decided to leave the VFO buffer amp outside the basic design and leave it to the responsibility of the interface to the rig itself. However I did protect the input from excessive voltages via a diode to +5V. Below middle is the buffer amplifier I use and which I found works very well. The timing diagram illustrates how the each complete cycle is divided up. The first half of the cycle is for counting. When the count is complete, the display is switched on during the entire second half of the cycle. But since the reset pulse occurs during the 4'th quarter, the LED's are blank, creating an effective duty cycle of 1 : 4 (25%). Other outputs than Q12 on the 74HC4060 can be used to create shorter duty cycles. In the Mk2 counter I use Q8 (pin 13), for a duty cycle of only 1 : 64! This Mk1 counter was built "ugly" style on a piece of unetched PCB stock measuring approx 45mm square. 3mm clear-lensed yellow LED's were used for the display. No particular effort was made to miniaturise this counter, since it was being used for development and optimisation of component values and I needed to be able to change components easily. Nevertheless the final size is respectably small! 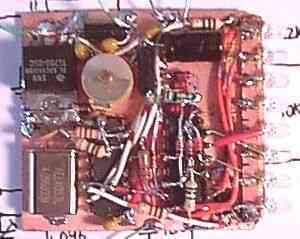 I intend to install it in the front panel of a 20m SSB QRP transceiver which is also under construction. Below is a redrawn circuit diagram using conventional logic symbols in place of the actual discrete component diode-resistor implementation. This drawing may help you to understand the actual operation of the circuit. The photograph shows the counter in operation. The frequency here is indicated as 53.5KHz. In fact I am measuring the frequency of a 3,653.5KHz VFO. An interesting feature of this counter's display is the flickering effect. On any reasonably simple frequency counter the rightermost digit will flicker between two adjacent values, this occurs on all my numeric display frequency counters. When near the border between two nearby values such as 799 and 800, all three digits will flicker between the two. An identical effect occurs on the simple binary counter, except it is far more pronounced. For example, the case where the three rightermost digits of a numeric counter flicker is 1 in every 1000 readings. With a binary counter due to being base 2 rather than base 10, this effect on the right three LED's increases to every 1 in 8 readings (I hope this explanation is clear). The right LED indicating 0.5KHz is ALWAYS flickering. But I don't let it annoy me! No, it's a FEATURE... the brightness of that 0.5KHz LED provides some indication of where the frequency is within the range sub-500Hz, effectively providing me with a better resolution than 500Hz by considering this LED as an analogue frequency indicator of the range 0 - 1000Hz. Neat. Prepare to be amazed. The Mk2 version is a work of art. These photographs scarcely do justice to the tiny size of this counter. 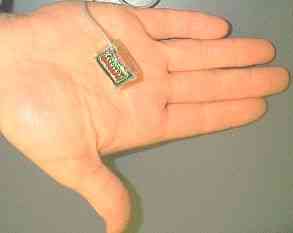 Below it is shown with the case removed, next to a paperclip used to prise it from its case. High performance components were chosen for small physical size and to provide low current consumption of below 5mA. The TO-92 packaged LM2936 5V 50mA voltage regulator has a bias current measured in uA. The 2mm high brightness high efficiency GaAlAs technology LED's offer 1mA current consumption, one twentieth that of a standard LED. The 4.096MHz crystal is in a low profile HC49/4H style case. The trimmer capacitor is the tiniest I could find. Yet, none of the components used are surface mount. The enhanced physical and electrical specifications of these components more than trippled the total cost (including postal charges) to approx £7.50. Here's the slightly different circuit diagram of this implementation of the counter. Notice some slight changes to some of the component values. 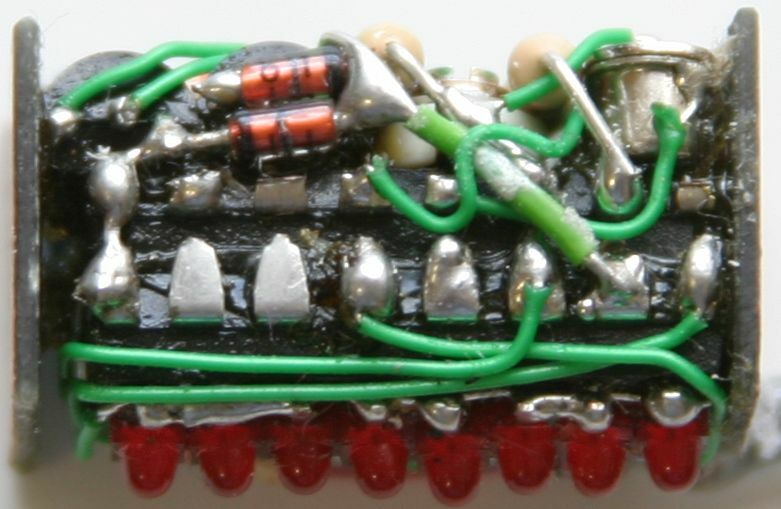 The series resistor in the 74HC4060 crystal oscillator was increased from 2K2 to 4K7. Experimentally this was the resistance value producing lowest current consumption and saves approx 100uA relative to the 2K2 resistor. The base resistor of the BC547 was increased from 1K to 5K6 to reduce current consmuption, representing a good compromise between brightness, efficiency and current consumption. I use Q8 (pin 13) of the 74HC4060 to give an incredibly low duty cycle of 1 : 64 for these LED's, which are still very bright (see pictures). Construction: Well the Mk2 doesn't use a circuit board at all. 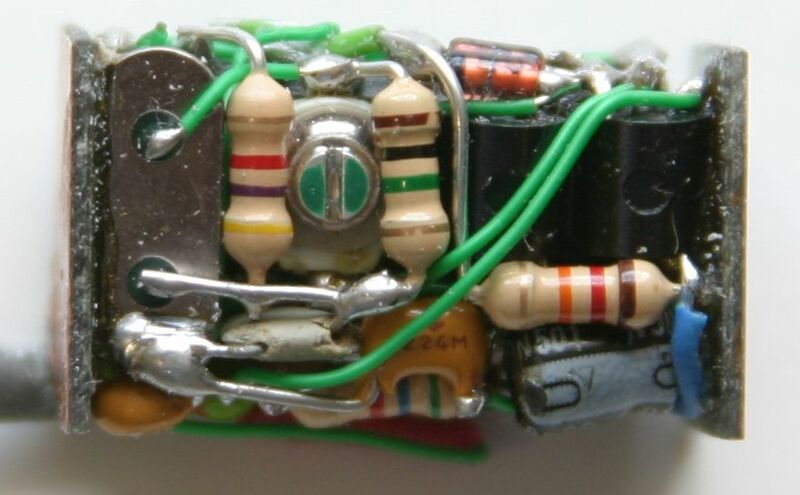 The two IC's are glued on top of each other, and their leads cut very short. 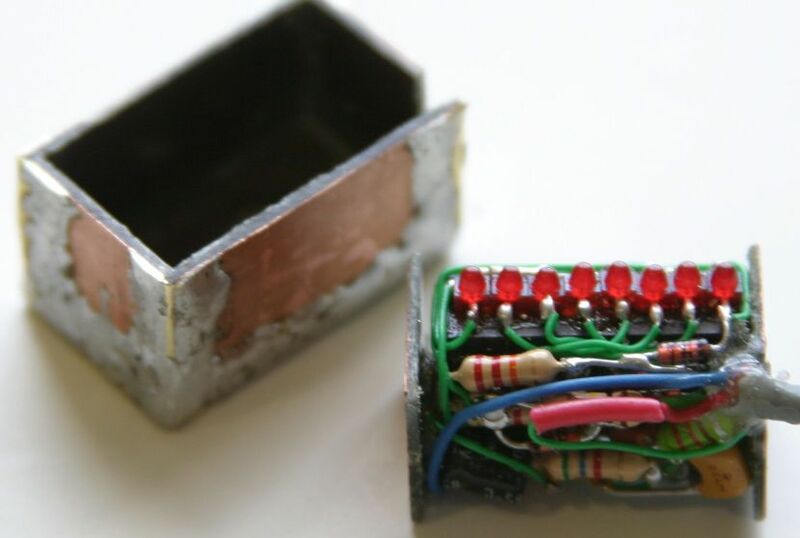 The voltage regulator, switching transistor, crystal and trimmer capacitor are glued to the bottom IC (74HC4060) and their leads also cut to about 2mm length. The 8 LED's are lined up and glued on the top IC (74HC4040). The remaining components are just piled on in the most space-saving way I could devise. Connection to the counter is via a twin screened cable (+V, Signal and GND). Here's the back view of the innards. Click the picture for a real closeup. This tiny Mk2 counter even has a screened box to keep the digital noise out of the rest of the receiver! The box is made from single sided PCB stock, with the copper side outwards (so as not to short the internal components). The edges are soldered on the outside by applying thin strips of brass shim over the edges and soldering them in place. 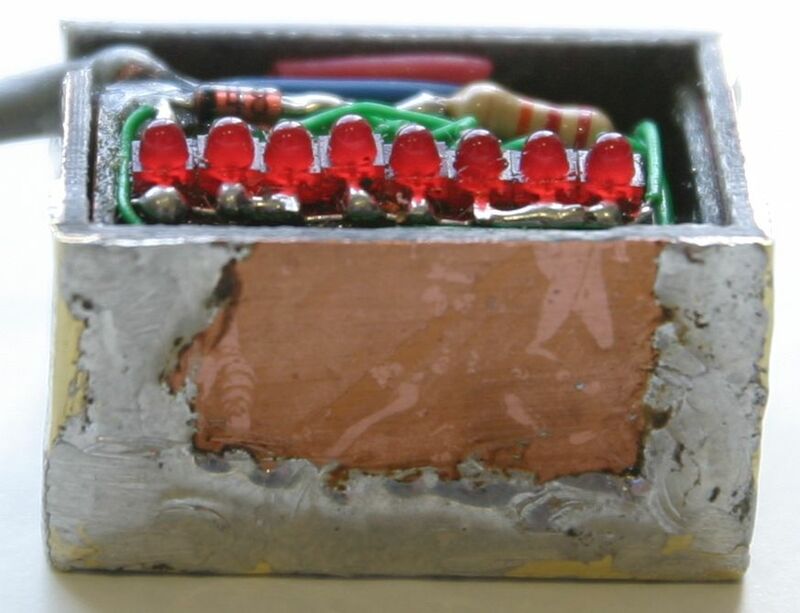 This unique construction technique is an inside-out version of the usual boxes made from PCB stock. I should also mention that this particular PCB stock from my junk box is fibre glass and half the usual PCB thickness you're used to. Small squares of PCB are stuck at either end of the circuit, and position it perfectly and firmly in the box. 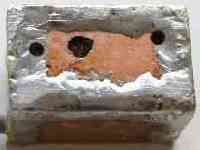 On the rear of the box are two small holes and one large one. Inserting paper clips into the small holes enables the frequency counter to be gently eased out of the box. The holes are carefully drilled to coincide safely with the centre of the crystal and the voltage regulator, two points which can be safely poked without damaging the tiny circuit. The large hole permits a jewellers screwdriver to access the trimmer capacitor and calibrate the frequency counter. There is no front panel. The intention is to mount this frequency counter in the front panel of a portable tranceiver having a PCB-stock case, with the copper side inside. A small slit will be cut in the front panel for the LED's, and the copper outside of the frequency counter box soldered to the front panel at its corners (permitting easy removal if necessary). This will complete the RF screening of the counter. Due to the switching nature of the counter, some interference might find its way back into the receiver either via the VFO or via the supply lines. Careful attention to VFO buffering and/or supply line filtering may be required. It might be advisable to fit an on/off switch so that if a harmonic is troublesome the counter can be temporarily disabled. Updates will be posted when I have experience of this. It is interesting to look at the distribution of current consumption in the Mk2 counter. The LED's consume about 1.2mA when all are lit. The diode-resistor logic, switching transistor, IC's and voltage regulator consume a further 1mA approximately. Which means about 3mA is consumed by the cyrstal oscillator alone. If a more efficient oscillator topology was available it would perhaps half the overall current consumption of the frequency counter. But I don't know enough about oscillator topologies. I have received an enquiry about the diagram on page 4 of SPRAT 121 (Winter 2004/5). I suspect there may be an error in this diagram, and that a correct working version would be as shown below. Note increasing the input resistor from 1K to 10K would probably be a good idea. This is a modification to display in BCD, 00 to 99kHz in 1kHz resolution. Easier to read 4-bit BCD than 8-bit binary, but you lose the 0.5kHz resolution LED. Thanks to Rune Madsen in Norway, who built the counter and sent me a correction to my diagram - some pin numbers wrong on the U2a and also U1 was wrongly labelled 4040. 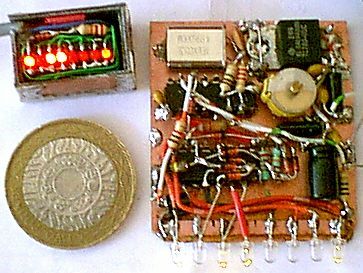 This is a version of the simple frequency counter which uses an additional IC, but has 45kHz offset, such that it would be suitable for frequency display in a radio with a 455kHz intermediate frequency. Other intermidiate frequencies could easily be accomodated with a different choice of diode gating. Chip writes: "Here is photographic proof of the functioning counter. I'm feeding in 3.527 MHz from a signal generator at 0dBm. 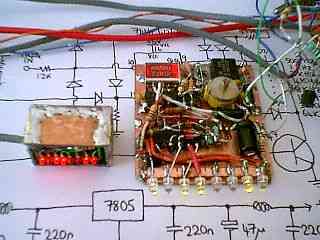 With the rf buffer amplifier on the input the counter functions with the input signal as low as -27 dBm at 3.5 MHz. With the LEDs operating as shown in the photo the current consumption is 20 mA."